Jayjay Zifanwe and I are heading up a new project called the LEA Full sim art series. The details are below but essentially you will receive a full sim for one month. It will be up to you when to open your exhibit, if for example you have built much of the work off site and need only set it up then you could have close to a month for the showing. If you are building fresh then it will come down to how fast you can get it done in time for an opening. So as it says below send us a 100 word explanation of what you wish to do by the 10th of September. 1) Send a NC to both Jayjay Zifanwe and Bryn Oh with a 100 word description of what your plan for the full sim artwork is. Recently Glyph Graves created a really neat build in Second Life using Kinect to chart his real life face into prims within SL. In the process of seeing his work I came across this video of someone using kinect in a similar manner for the game Minecraft. It should be noted that this person was not hampered by an internet connection or server so he is basically working off the processing power of his own computer, whereby doing the same in SL is quite another story. I played Minecraft for a day until I dug myself into a very deep hole and was daunted by the huge amount of effort it was going to take me to climb out again. But what's impressive about this it recognizes the colours of his shirt and look at the speed that is builds him juggling or his cat playing. I just had to post it. In the recent updates to Firestorm and Viewer 2 there has been an adjustment to a default settings. Changing a default setting is likely or should be well considered before implementing as it defines how the new user will interact with Second Life for many months before they even contemplate customizing their own viewer. They will just accept what they start with and assume that's the extent of the experience. So the change I am talking about is called LOD. LOD is level of detail and it applies to an objects mesh. The higher the LOD the more crisp the sculpt or prim from a distance. A low LOD setting will render things as blobs until you get very close. My LOD setting is set to 4 which means everything generally is crisp from even great distances. In the image you can see a sculpt fox which keeps its shape nicely from the distance I took this photo. Should the LOD have been set too low then the fox would have blobified itself. It's not a nice effect and many builders are concerned at the moment because the default setting for LOD has decreased to 1 or the lowest setting. This will help the low end machines perform better in second life so I am assuming that is the intention in decreasing it. I know there is alot of excitement about the coming implementation of mesh and I look forward to making more detailed works in SL too. However it is very important that we understand mesh will not nor should not push out the use of prims nor sculpts. 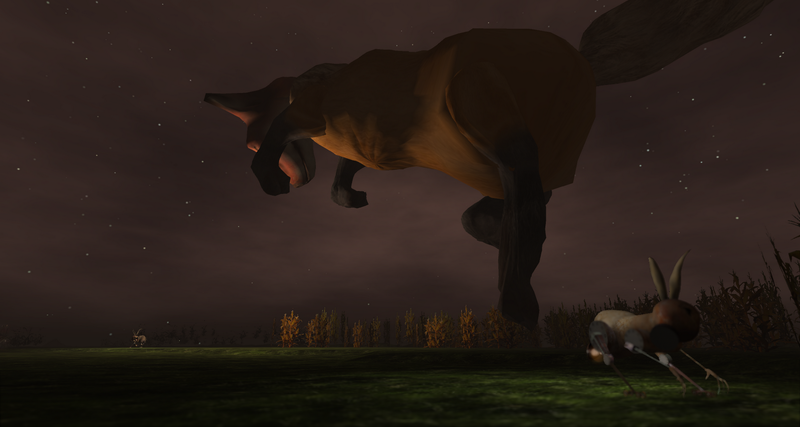 The fox you see here is a total of 7 prims. If it were done in mesh it would likely rise to around 500 prims because currently the size of your work as a mesh varies the amount of prims they will cost. 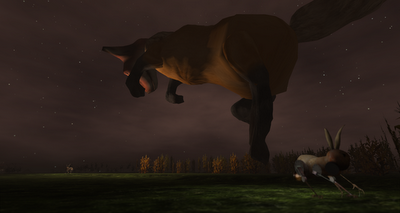 The benefit in making this fox worth only 7 prims while being on megaprims is a huge benefit over mesh at the moment. So lets keep that in our arsenal of tools when building. But a sculpts overall value will diminish greatly if they end up looking like blobs to the vast majority of users. Because you buy a large nail doesn't mean you should throw away all your little nails and screws. Another thing to consider about sculpts is that a huge portion of the economy from fashion to furniture is now based off of sculpts. People will not like the idea of replacing items because things suddenly start looking less appealing. As well many of the artworks in Second Life will suffer the same problem. On phoenix viewer, in the bottom right, is a scalable tool to rise or lower LOD. It's not hard to find and easy to change. On viewer 2 and Firestorm I have yet to find where to adjust the LOD setting and I am an experienced user. A new user will never find the LOD setting before they determine whether they wish to stay or not. I spoke to Jessica Lyon (Phoenix/Firestorm viewers) the other day about this and they will be increasing LOD to 2 or 2.5 for the next update, but a similar attempt to speak to Torley Linden has not been successful. Thing is I have no idea who to contact about this at Linden Lab so that is why I am writing this post. Also while I am at it please add the multitude of windlights to Viewer 2 and revert the way we adjust windlights back to how they originally were. Right now I can't edit any default windlights even slightly which is a huge problem for machinimatographers. Sometimes you just need to lighten a windlight or make a minor change which takes seconds but unfortunately now you must create a whole new windlight. Oh and the preview shows only 15 pages. It is 42 pages. I made a physical book for Anna's Many Murders so I can read it to my brothers little daughter at night.... oh wait that's a terrible idea she will have nightmares. Oh well too late I have already ordered them one. One huge benefit in being an artist is you can do inappropriate things and people just shrug it off saying "oh they are just an artist..." However if you do the same thing as a Lawyer people will exclaim "what on earth were they thinking!??" One huge benefit in being a Lawyer though is that these unjust comments just make you cry into your pile of money. People have been asking for Anna's to be made into a book and so here it is. And for those of you who have been asking for the full Rabbicorn story be made into one book then you will be pleased to know that I have begun to work on that as well. So hopefully it will be finished within a few months. I know I said that a few months ago but this time it really has a chance of being a true statement. Unfortunately the patron who had supplied me with a sim to build Annas Many Murders had come into hard times a few months ago when Annas opened and I took over paying for the sim. I can not afford to rent the sim any longer. So the build will come down in a week or so. I am happy to have gotten this machinima done though. The machinima can be shown full screen as it is HD. Should be a button somewhere to do that.